Cruise Control installed for the tarmac stretch, exhaust changed for the dunes. 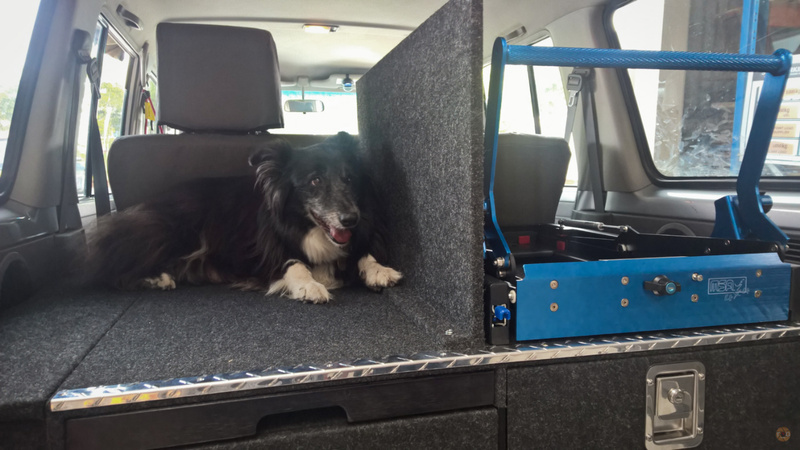 The rear drawers packed, we were ready. Oztent strapped along with Maxtrax, on the roof. 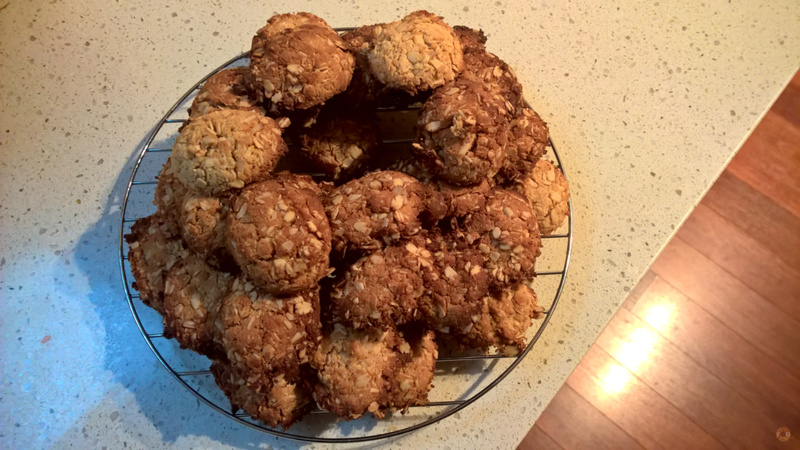 I had also baked a batch of Anzac biscuits, for the road. They waited, bagged, on the dash, with our permits. Annual Leave commenced but we were stalled, spiritually by the torrential autumn rain in NSW. But also physically, as David was fighting a flu. I had suffered and recovered from the same, almost a week earlier. 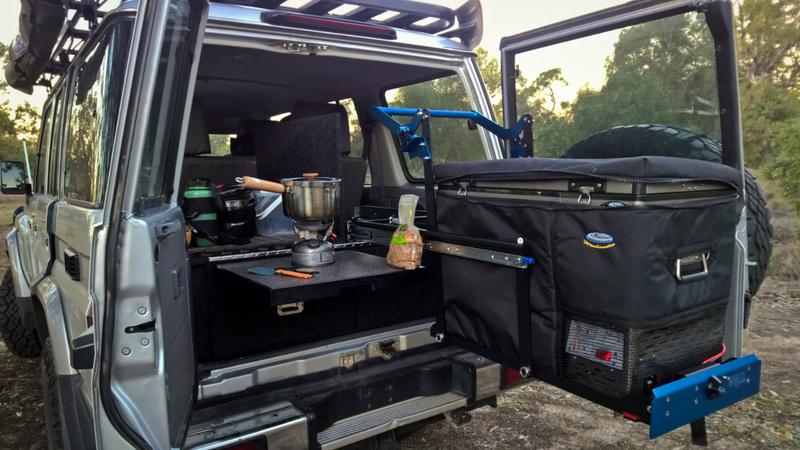 He had helped pack, by adding the Bushranger spare wheel bag and Oztent. But the 76 Series sat, ready in the driveway for three days after our planned departure date while he recovered. Impatient to go, I lured him the LandCruiser, promising medication en route. The rain, and the need for drugs would resolve in Wagga Wagga, our first stop. With David somewhat sedated and the rain all but a memory, I was able to make good time, but we stopped at Hay before we lost the light. Free-camped by the river, we supped on a premade beef stew. I had cooked at home and vacuum sealed a few meals, prior to leaving. Meat recipes with loads of fresh vegetables. A lesson from previous excursions. The camp wasn’t empty, but it was peaceful. Only a few of us, spread thinly. Just the intermittent, distant roar of semi-trailers on the highway interrupted the solace. We retired early, David still unwell, I was happily tired from the adrenaline of finally leaving home. After the autumn rain at home, we were grateful for the sun. 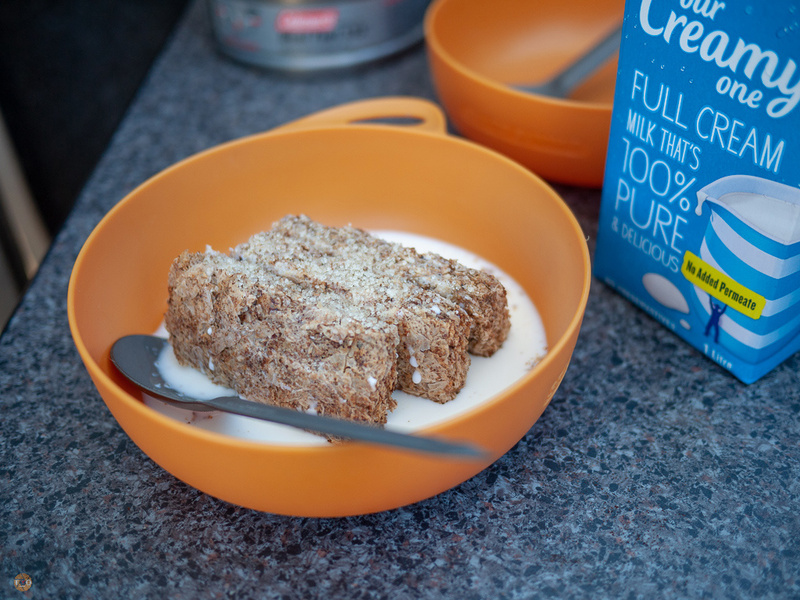 Weet Bix for breakfast followed by a walk along the river. Relaxed, we rolled out about mid morning, ordering extra large coffees and fuel in town. David trying hard to doze, head against the window. David was still poor company, so the drive was fairly straightforward. Music on, snacks and water consumed to soak up the snot, medication and bitumen. 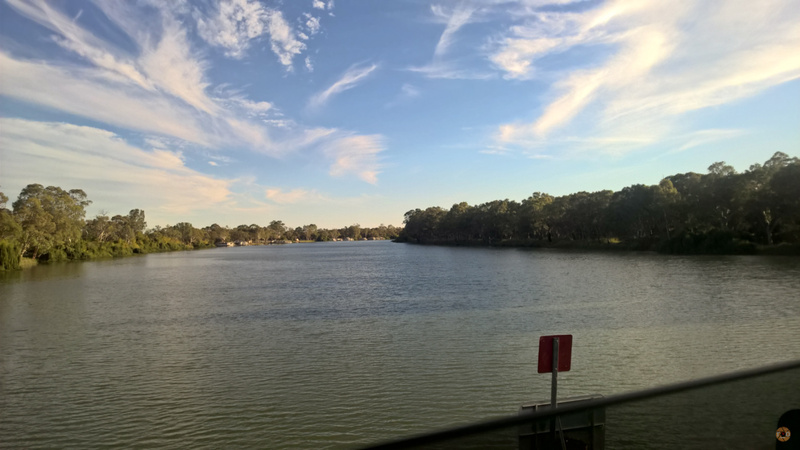 Choosing a different route through country NSW, entering Mildura was a metropolitan shock. 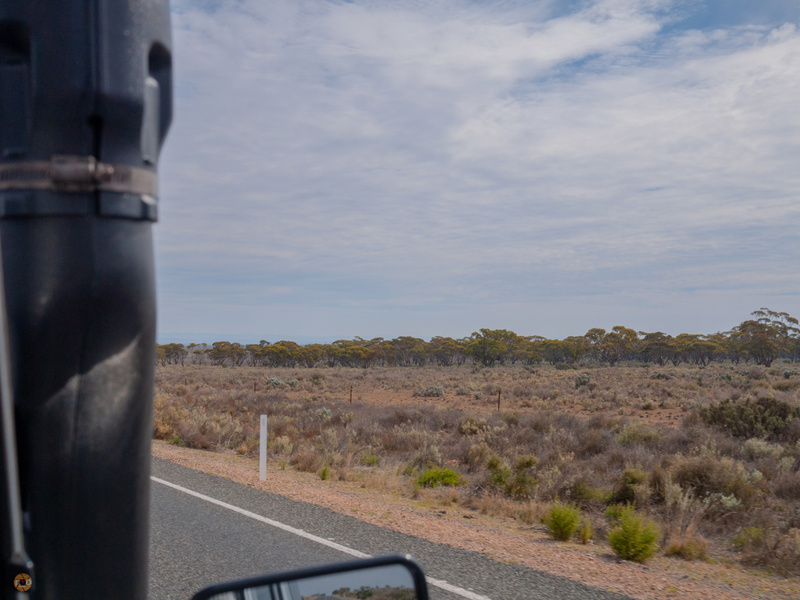 Aside from avoiding the familiar haul to Broken Hill, we had a pick up in Mildura. I had ordered a sand flag for our journey, and it was waiting us. After a quick lunch, we departed. With twice as many kilometres still to travel. 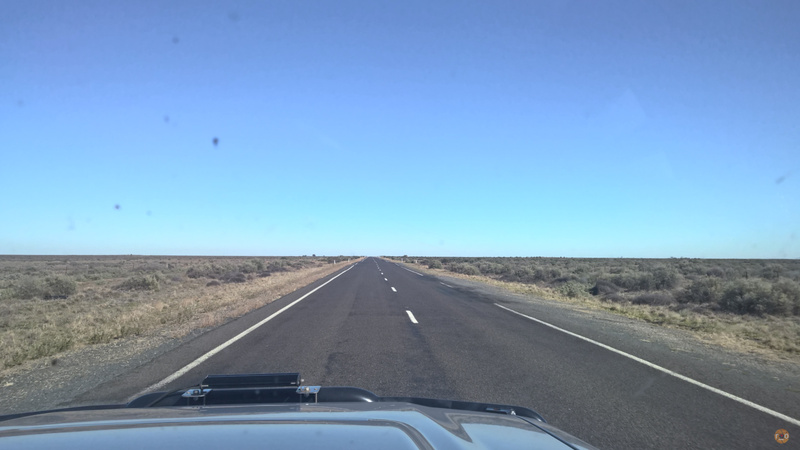 We were uneasy in Mildura, having tasted the horizon, we quickly felt cramped. Entering South Australia we donated our fruit and vegetables at the Quarantine station, I didn’t pack much, but we had eaten even less. 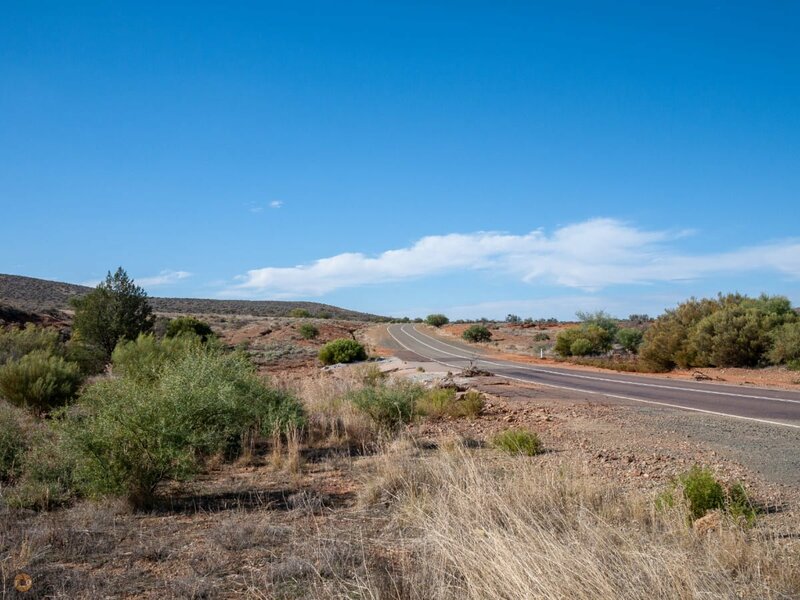 After that it was only the winding roads through South Australia’s golden river lands, and a spot of roadworks that slowed us down. 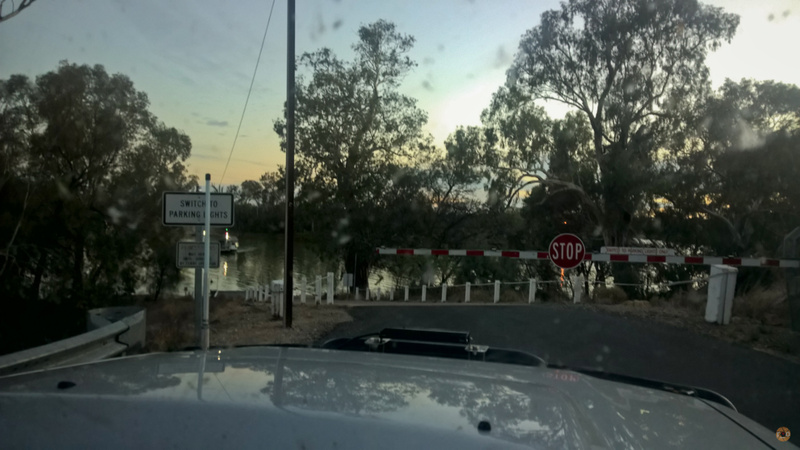 Avoiding the Highway, our route took us to Cadell, where we excitedly (Even David was momentarily animated) boarded a ferry to take us across the mighty Murray River. Our hour was late, but the ferry was still running. While we waited, we took in the sights and sounds of the river crossing. Including the raucous soundtrack of galahs. 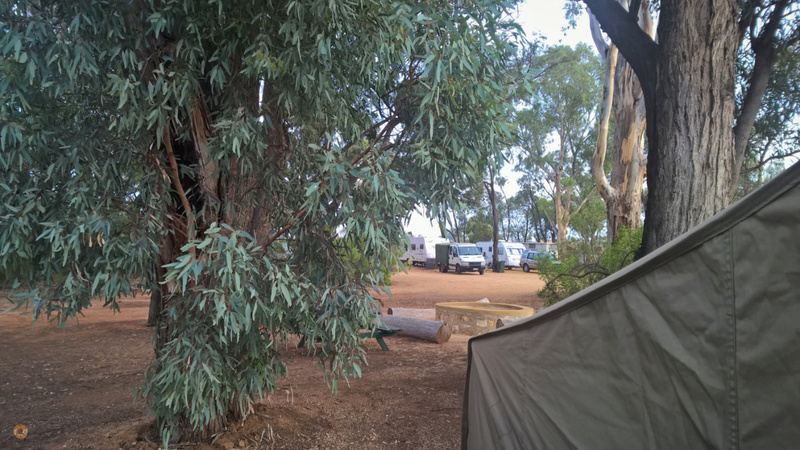 There is a well reviewed, cheap camp beside the oval at Cadell. We set up, the only tent resident. 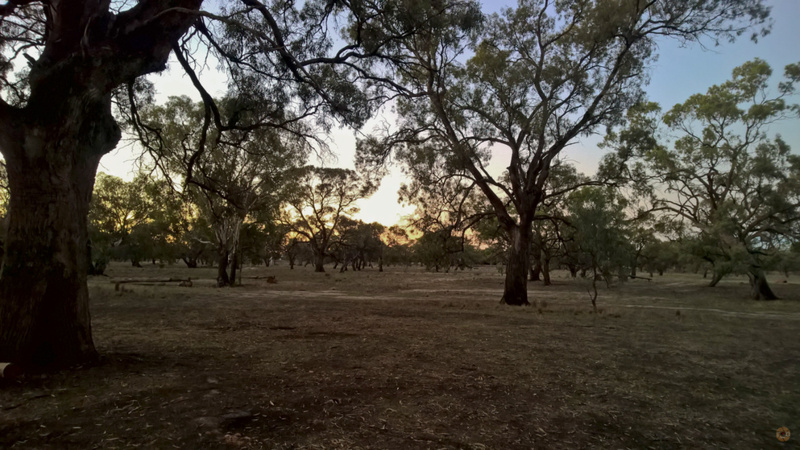 Away from the caravans, who were congealed under the shadey gumtrees. After a hot shower we ate, and without firewood, shivered through a chilly evening. Brewing tea almost perpetually to keep warm, until a respectable bedtime arrived. Leaving Cadell, the landscape changed. We stopped in the dusty town of Morgan and stocked up on fresh, as well as pantry stores, and snacks. Morgan boasted many stone buildings, stained pink from the dust. 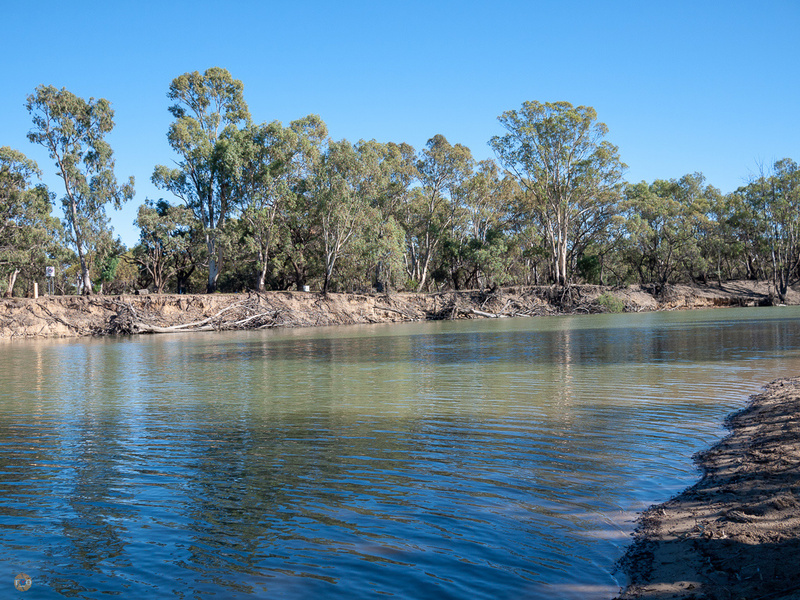 Located at a prominent elbow of the Murray River, its significance predates European settlement as a meeting place. The meandering westward river turns dramatically and marches South from here. Today’s drive was a real treat for us both. David was regaining some levity, perhaps this was the power of the red dirt around us. 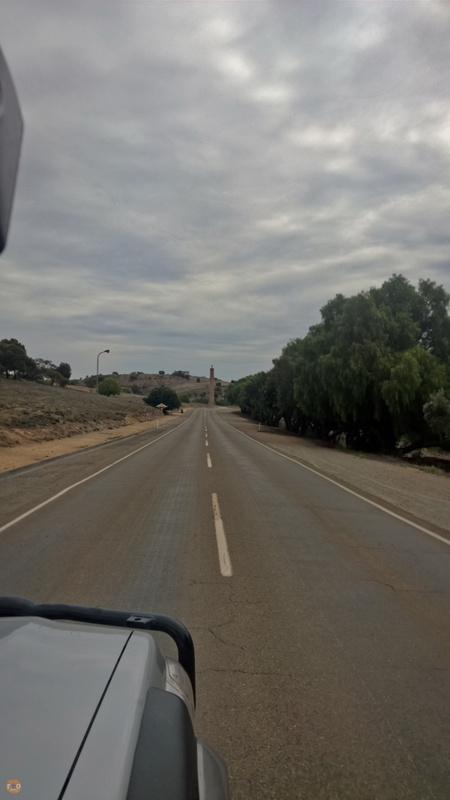 We wound our way up the Goyder Highway, stopping for fuel, before we travelled the RM Williams Way (wearing our boots) to Burra. A quaint township, with a scaling copper mine chimney marking our arrival. 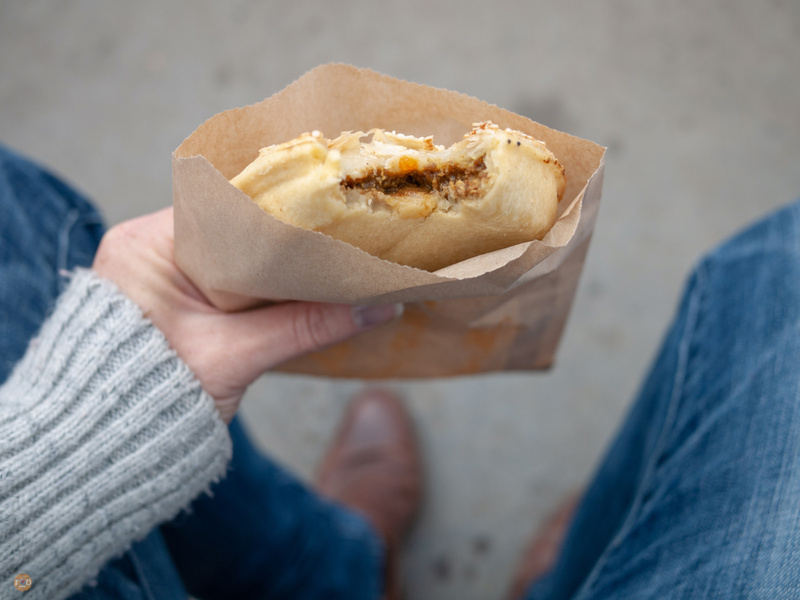 We sat in the centre of town and ate freshly baked pies. Although the sky was growing dark with cloud, this was great position to people-watch. We dropped a waypoint for a return trip and continued on our way. Stopping at Peterborough, we had a coffee and some cake at the perfectly eclectic Theatre House. Stretching our legs and getting an express education in Australia’s narrow track railway history. Peterborough, previously known as Petersberg, it was renamed after World War 1. Boasting all three gauges of railway track, its a popular draw. 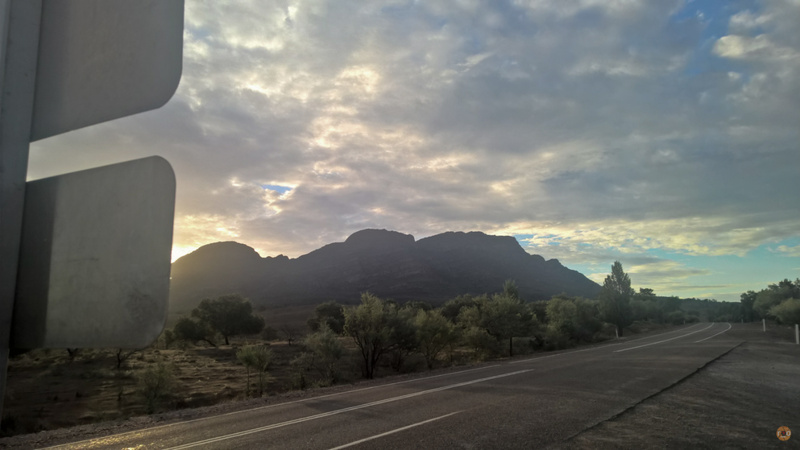 I can forgive the sky closing in if its contributed by ancient ranges and rocky outcrops. 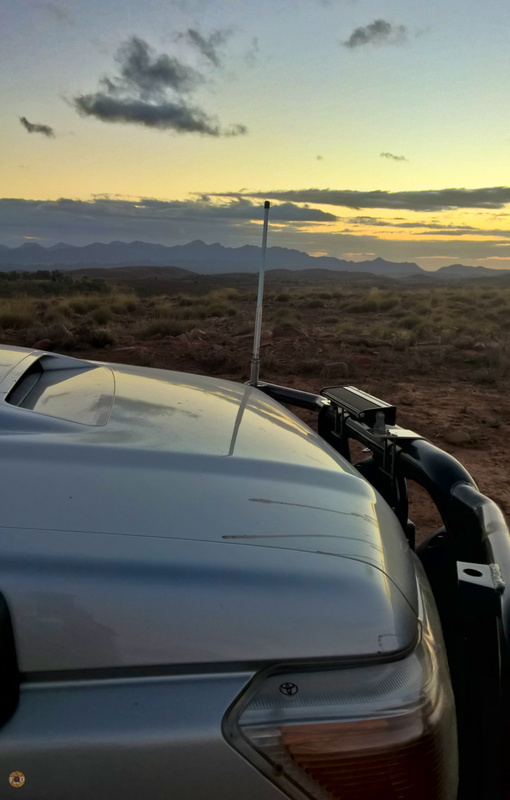 The Ikara-Flinders Ranges loomed in front of us and it was nothing short of distracting. The views warranted a slower drive. Somewhat overwhelmed, we stopped often and drank in the views. If I could describe this area to a New South Welsh person, I would liken it to driving a melted, leaning Wolgan Valley, Kanangra or Blue Mountains area, sans the altitude, urban sprawl or anything remotely blue. This landscape is strictly red and green. In Hawker I realised the date and hurriedly paid some bills, including registration and insurance for our silver steed, on the iPad. We brewed an afternoon tea in the Rest Area. 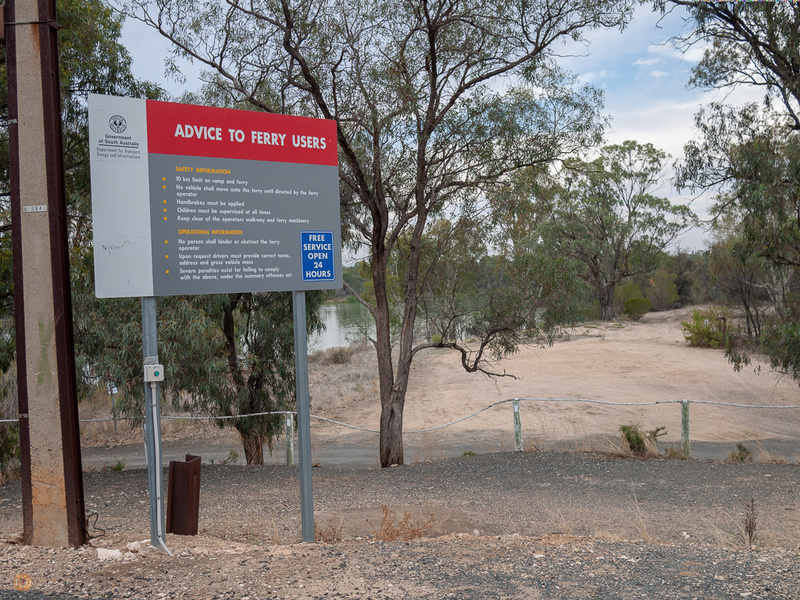 Our Murray River sleep in and multiple stops along the way meant our destination would likely meet us in the dark. Fare-welling mobile reception, the fuel station and espresso coffee – we set off into the hills. 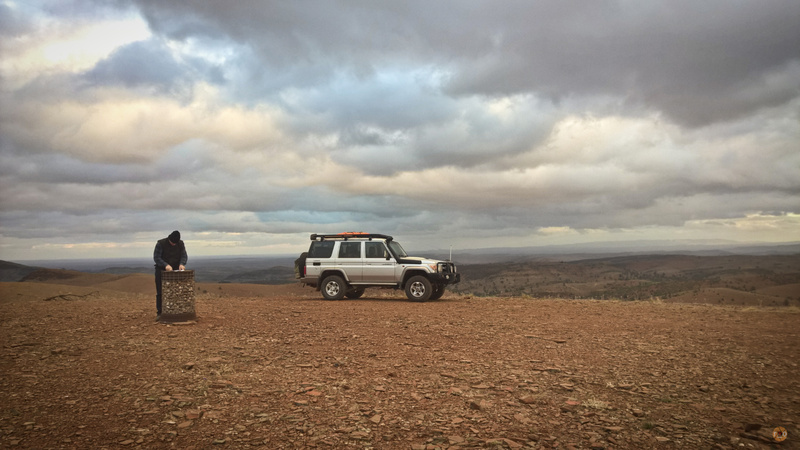 Stopping at Stokes Hill Lookout, we were re-energised by the rolling layers. The setting sun was throwing pearly colours on the clouds. But also, there was the chill. It was very windy and it cut to the bone. The wind blew in new clouds to replace the old, ebbing darker and then lighter again- who knew where the storm might land. 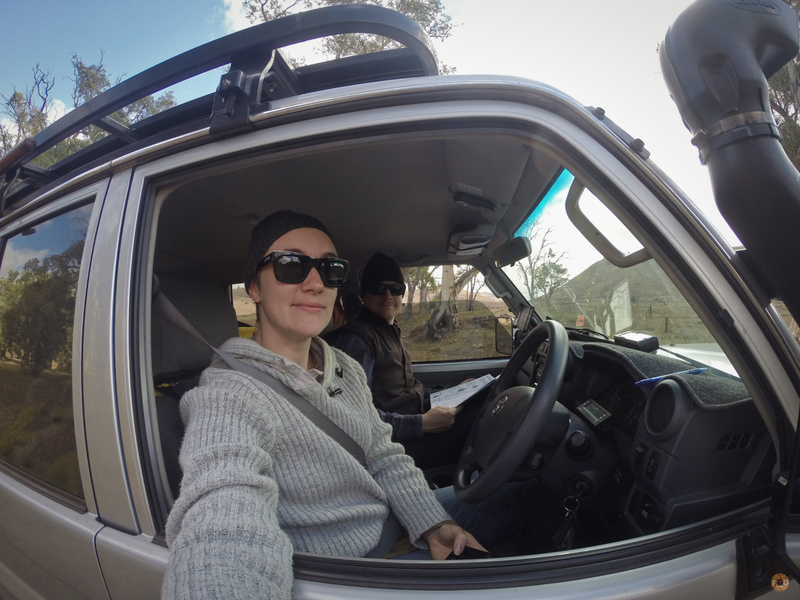 We stayed as long as we could, but the cold and impending dark drove us back to the LandCruiser. Checking in at the Willow Springs homestead was something new and exciting for us. Our first Station Stay, the lady helped us pick out a site before giving us the directions. 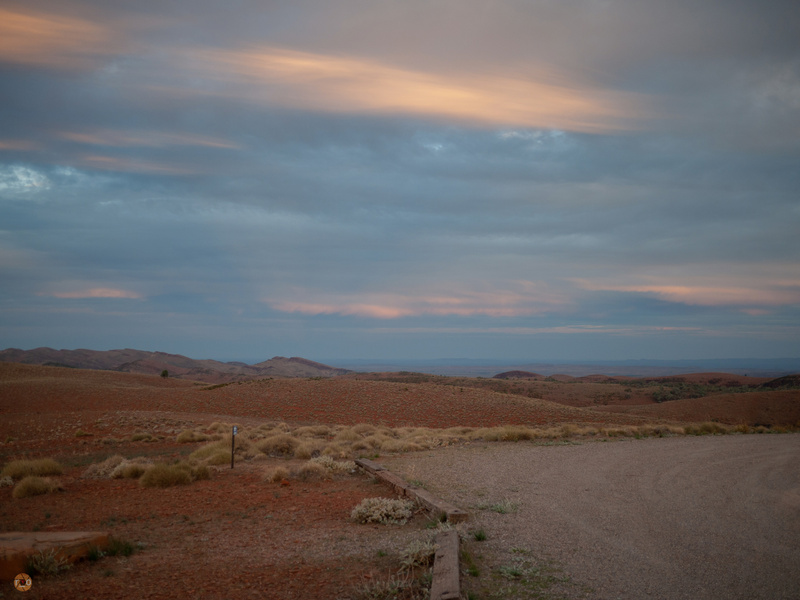 A private, bush camp, tucked away on a 70,000 acre sheep station. Complete with a nearby pit toilet tank. We settled in. We would drive back and check out the ablutions block tomorrow. Bush camp isn’t quite right. 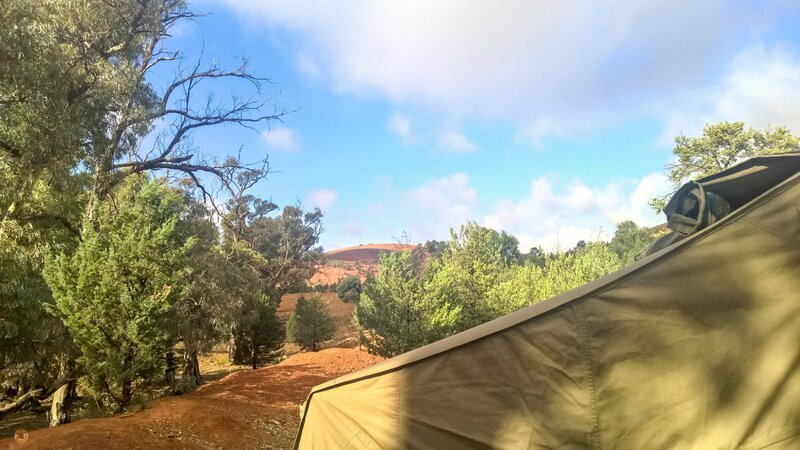 Our camp was on a pretty, raw outcrop, a flattened site marked with a table and fire ring. 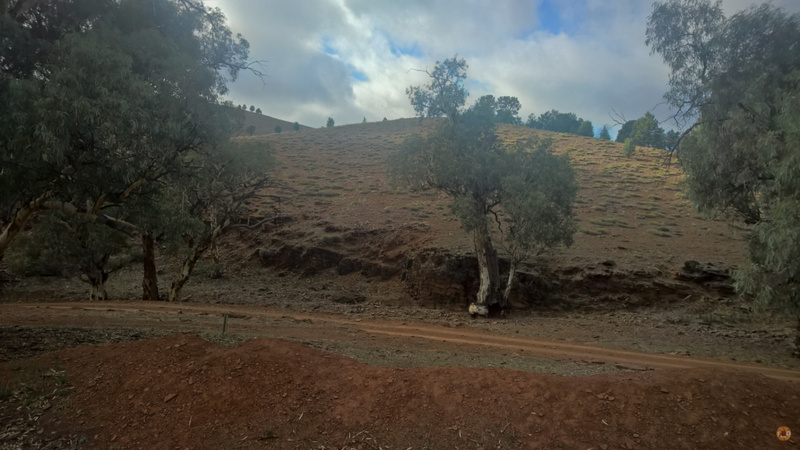 The surrounding area was dotted with ancient gums but mostly dark native pines. This landscape was just so, new to us. Being an active Station, we were likely in a retired paddock of a bygone era. 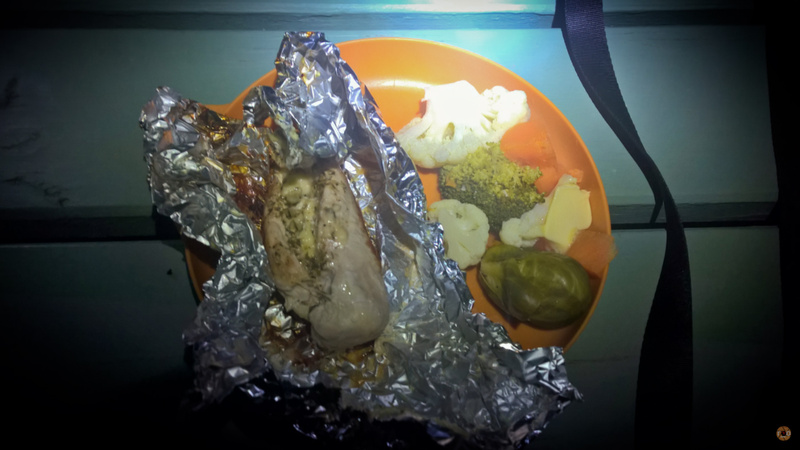 In the cold wind, we set up the Oztent and wrapped chicken up in garlic and foil, using the fire ring’s hot plate. Despite our intentions, we retired early. The wind buffeted the Oztent unlike we had ever experienced before. 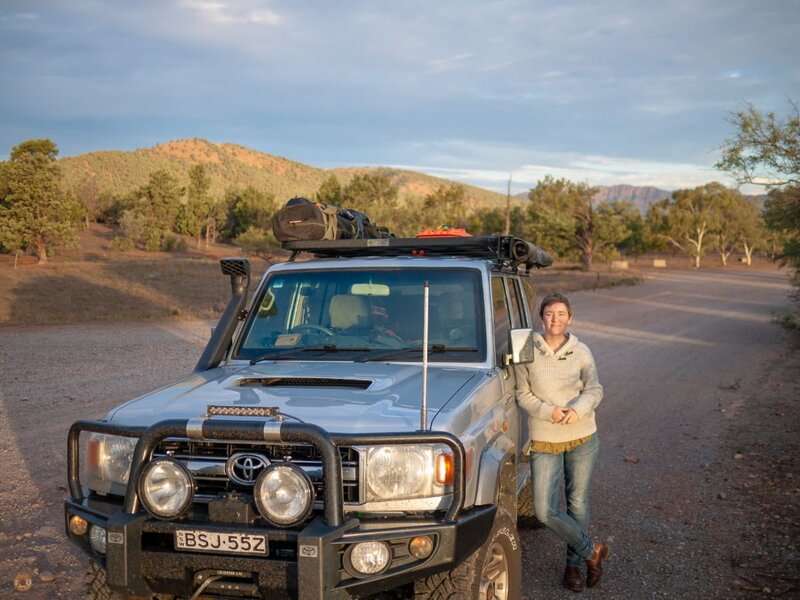 Despite the LandCruiser parked close, the whirling wind had no distinct heading. We slept, lightly. After our fitful night we were slow to rise. With the tent zipped and pegs given an extra tap, we left it to Nature’s will. 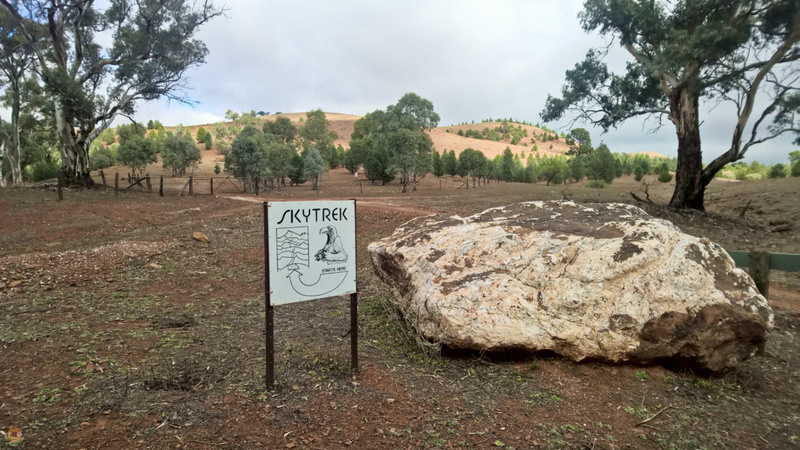 Some 80km of Skytrek trail awaited. 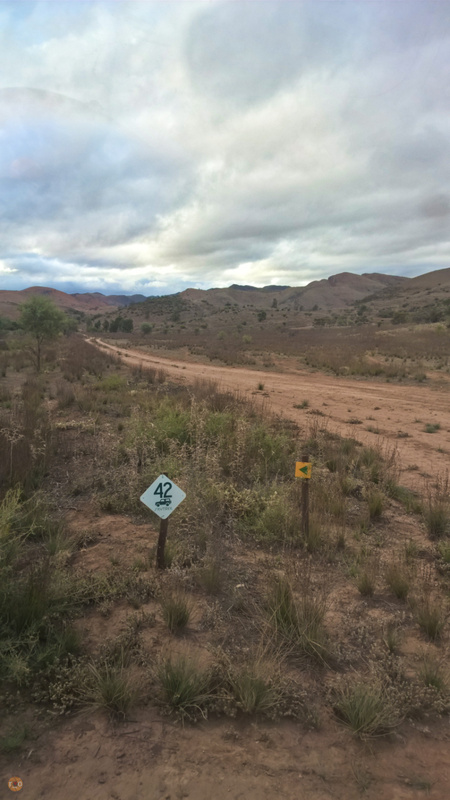 A self-drive tour of the property. We had paid for, and received our guide the night before. 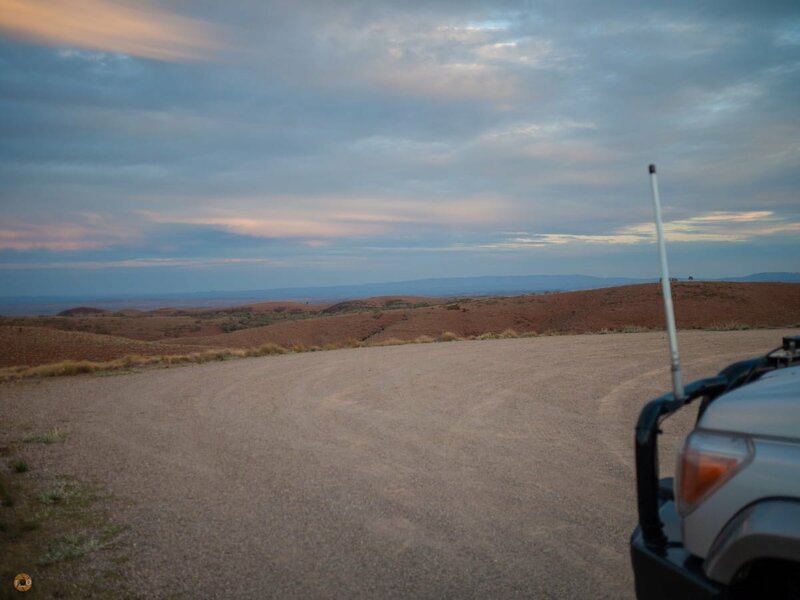 Driving through the red rock gullies, we barely noticed the heavy clouds. Getting out however, we were accosted with the cold wind, and it only grew colder as we slowly climbed and gained altitude, on the plains. The drive isn’t technical, but it is a bit rough in places. Easy to follow, we felt like kids again waiting for the next POI marker. David was reading the history and stories for each as we ambled along. Often getting out, to soak it all in. Bees swarmed about the old soaks and troughs. The wind continued to howl and whistle through the wire twined logs of a pastoral hut. Remarkably sheltered, albeit fine dust making its way in, we imagined it seasoned the dampers, and dusted the billy teas of yesteryear. At the hut would be the only time we saw anyone else. 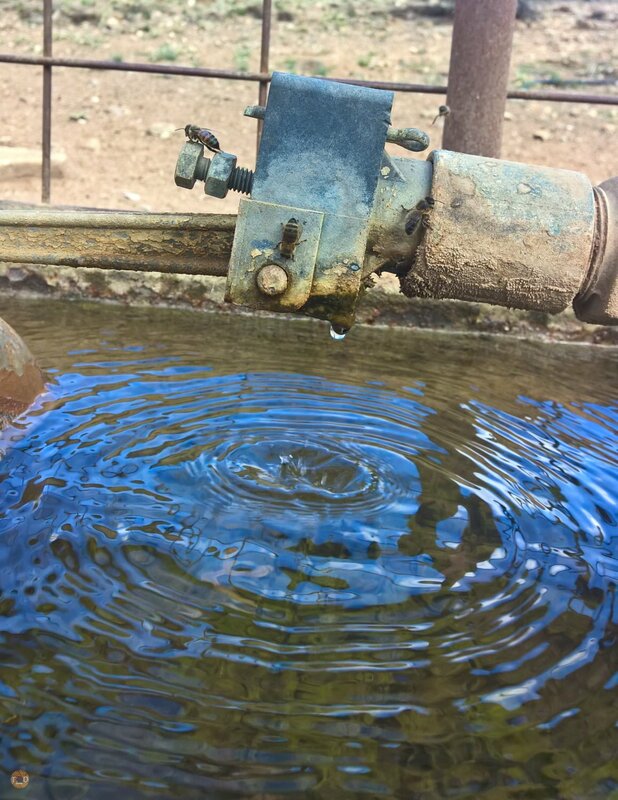 We waved to workers on dirtbikes, their modern day brumbies, mending a fence. The variation in this property was impressive, and no less wild where ever we pointed. 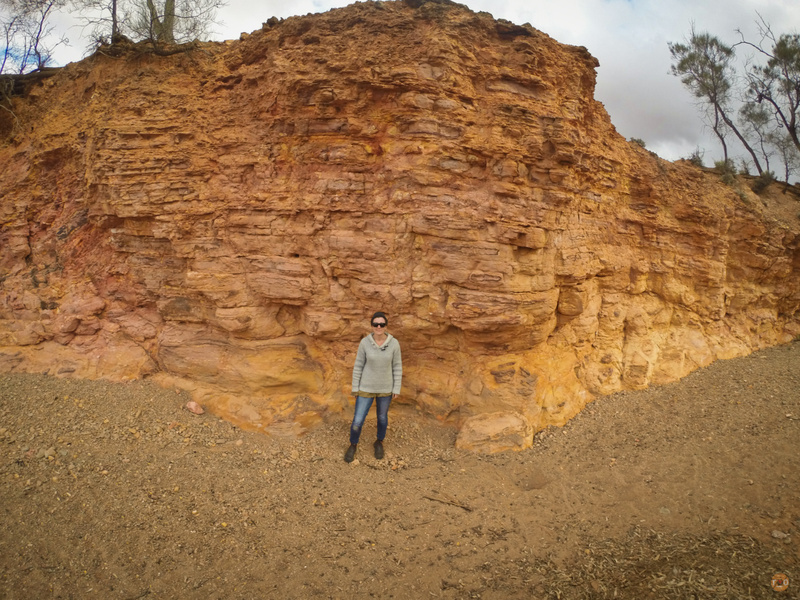 Ochre cliffs, dried river gorges or windy, bald plains. Something like a red dirt Mongolian Steppe from the National Geographic magazine. 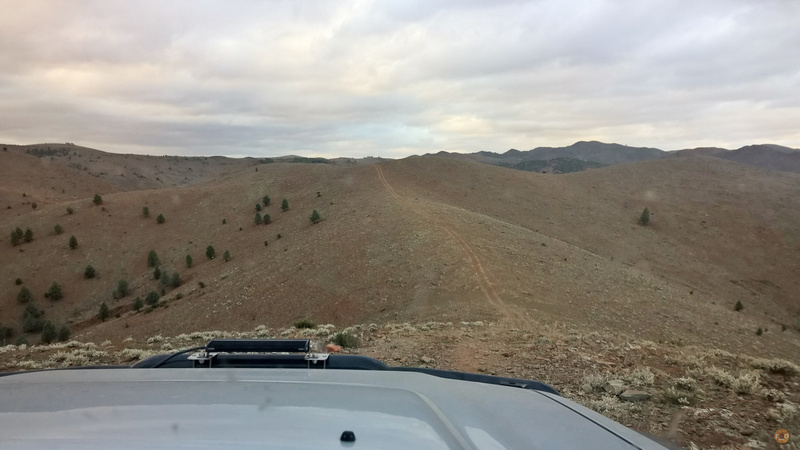 Descending a particularly steep section, I brought the LandCruiser to a skidded stop, the clutch clattering in protest. I had spotted our first wildlife. A large echidna on the track ahead. Forcing the door open against the wind, I ran to say hello. Predictably stacking it, and well. I collected most of the prickles in my palms and knees and donated some skin, neither of which hurt until the next day. Laughing as I was, the adrenaline numbed my stupidity. David’s laughing turned into coughing, and we pressed on. Living up to its namesake, Skytrek. In our usual fashion, we drove this track slower than the prescribed time. As I recall, I could have taken it slower. We had the landscape to ourselves, as we didn’t see anyone else. In the lowering light, we were level with the clouds at the lookout. As frigid as it was the day before, today, we were almost stupefied by the wind. The view was incredible. My imagination took us to one of Saturn’s tumultuous, windy moons. The sky was a mix of galvanised grey and glaring white. The horizon a kind of muted orange, the hardy beige grasses softening the edges. Battling the cold, we took a few photos with my Nokia phone before continuing on, we still had Points of Interest left on the mud map. 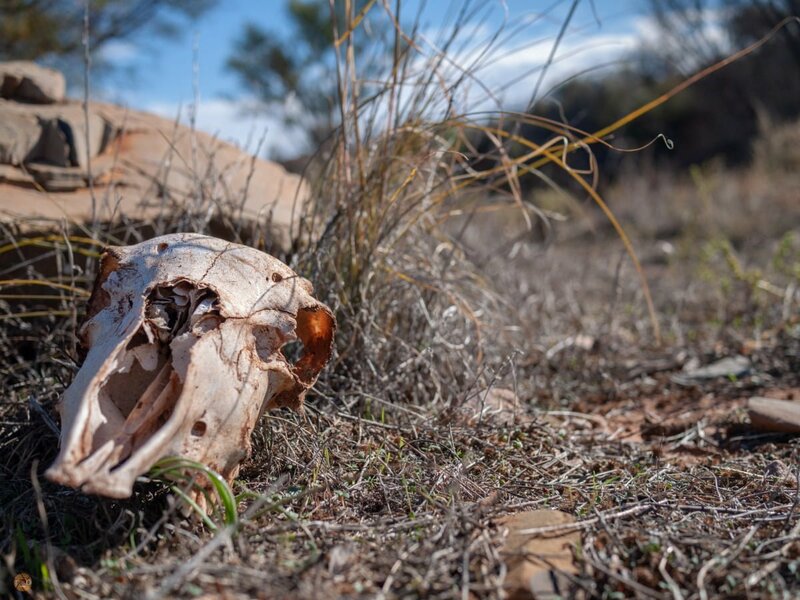 We were treated to spotting a family of Yellow Tailed Rock Wallabies, a stunning marsupial, I remember writing a school report about them, so to see them in the wild protection of the Station was a sentimental experience. 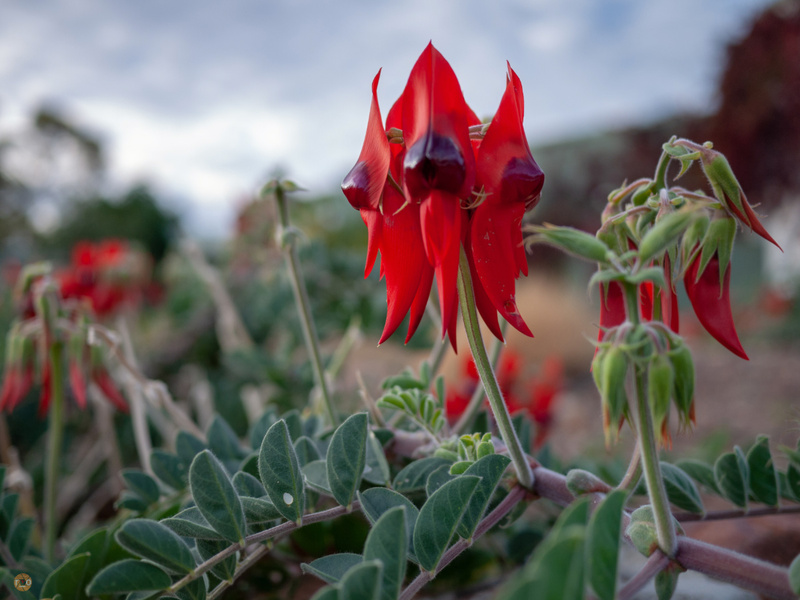 In the low light, the finale of our tour was a drive through a high altitude grove of Grass Trees, we had never seen so many at once, alone, almost void of other flora, They were all flowering too, long squiggly tubes aiming for the sky. Appearing as black silhouettes against the last glow of light. These alien sentinels in their outerworld landscape supervised our descent toward the Station, its few lights guiding us home. 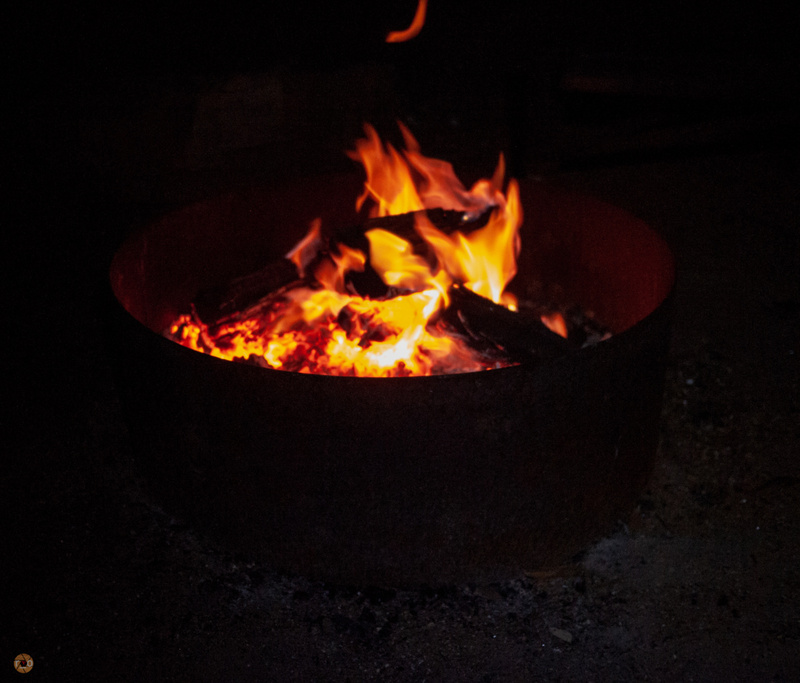 Back at camp, we had a fire splutter into life and cooked steaks, garnished with a salad and fire roasted potatoes. The wind was still blowing, but either its ferocity was fading, or the high altitude gale of Skytrek, had hardened us against the chill. Running out of wood for the fire, we drove back to the homestead to have a hot shower. 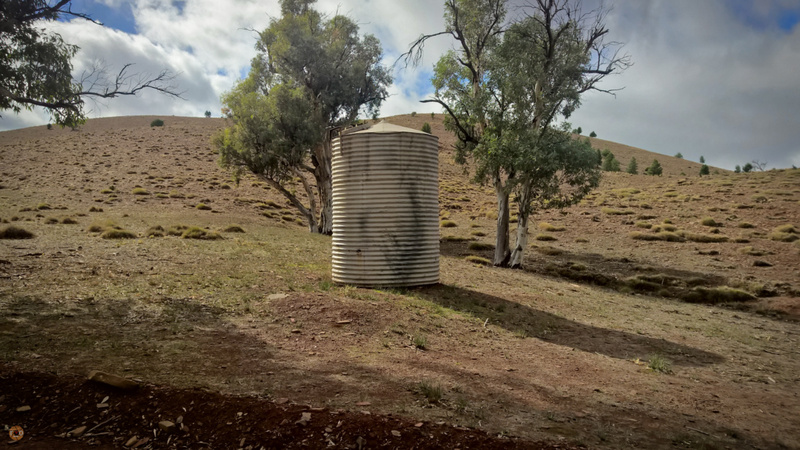 A tin shed structure has a few shower partitions offering hot water yes, but with an open roof and floor. The wind would whip inside the cubical. Sometimes blowing the water sideways, and giving my goosebumps their own goosebumps. An exhilarating drive, followed by an invigorating shower. Washed, we retired to the tent thoroughly content with our day, and what tomorrow might present us. We had packed our few things, ready to break camp. The wind carried some rain, which tapped on the canvas in erratic pops, but never committed to a full shower. We both slept well. Love the writing style and the photos. Seems like you had a great trip despite the cold. Thanks so much, glad you enjoyed the trip. Thankfully, we escape the chill, rather quickly in the next chapter.